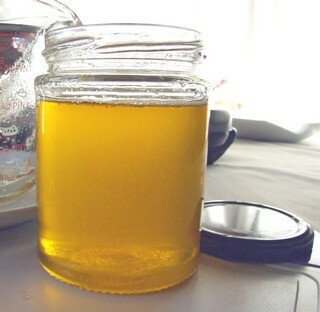 If you have been following my recipes and articles you will know that I only use and recommend heat stable fats for cooking like coconut oil and organic clarified butter. These fats are predominately saturated with a very stable chemical structure, which can withstand cooking processes like baking, grilling, frying and so on. Don't be put off by all the negative hype about saturated fats. Modern oil production uses processes like hydrogenation, chemical solvent extraction, bleaching and interesterification. These highly processed oils are the real enemies to our health and contribute to many inflammatory and autoimmune disorders. See my previous article on the health impact of processed oils. I use and promote fats and oils which have been traditionally used by mankind for years like coconut oil, butter and monounsaturated fats like quality virgin olive oil, which I reserve for dressings and pouring onto food after it has been cooked. 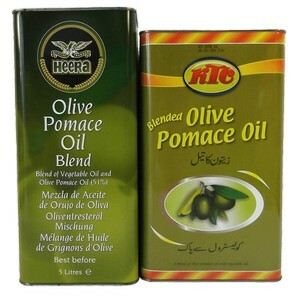 I have noticed here in the UK a lot of people are using pomace olive oil. What's Pomace olive oil you may well ask? Many restaurants and Indian/Pakistani households in the UK use this oil thinking they are getting the health benefits of olive oil at a considerably cheaper price than virgin olive oil. However pomace olive oil is the most chemically refined type of olive oil you can buy. This oil is chemically extracted using high heat, chemical solvents and deodorisation and is made from the leftover pits and olive pulp after it has undergone multiple pressings to extract olive oil. Read more about this highly refined and processed oil here. My thoughts about pomace olive oil are don't touch it! It's on the same level as refined sunflower oil and canola/rapeseed oils. So one of the first changes I made at the Healthy Spirit Hub Cafe was to bin the pomace olive oil and bring in coconut oil for cooking. It had to go, after all, it was my duty as a holistic nutritionist and coconut oil is extremely beneficial for health and well being. Around 50% of the fat in coconut oil is lauric acid. Coconut oil contains the most lauric acid of any substance on Earth. Lauric acid is a powerful anti-viral. The body converts lauric acid into monolaurin, a monoglyceride, which can actually destroy lipid-coated viruses. Contains MCFAs caprylic and capric acid which are anti-fungal which could help to address fungal infections like an overgrowth of candida in the digestive system. The medium chain fatty acids (MCFAs) are easily digested and readily cross cell membranes. MCFAs are immediately converted by your liver into energy rather than being stored as fat. Coconut oil is easy on your digestive system and does not produce an insulin spike in your bloodstream, so for a quick energy boost, you could simply eat a spoonful of coconut oil, or add it to your food. Coconut oil can withstand heating and satisfies both vegan and vegetarian diets. However some people don't like the taste of coconut coming through in dishes. For cooking at the Healthy Spirit, I needed a neutral tasting high quality coconut oil, preferably organic, which still contained the health benefits of coconut's medium chain fatty acids. 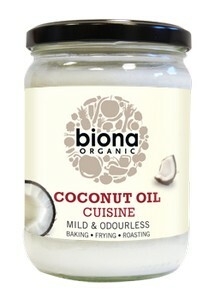 After some research I chose an organic coconut oil by Biona, which has been deodorised by steaming to make it neutral tasting. This deodorised coconut oil contains all the health promoting medium chain fatty acids, is organic and satisfies the vegans too. Perfect for cooking. So all dishes at the Healthy Spirit are now prepared with health promoting coconut oil.